The Most Rev. Mark Leonard Bartchak was ordained a Bishop and installed as the eighth Bishop of the Diocese of Altoona-Johnstown on April 19, 2011, at the Cathedral of the Blessed Sacrament in Altoona. Bishop Bartchak was born January 1, 1955 in Cleveland, Ohio. He is the son of Rosemary (nee: Beck) Bartchak-Shay of Garfield Heights, OH, and the late Leonard Bartchak. His mother’s ethnic background is German and Irish and his father’s background is Polish. (In the Polish language, the family name is Bartczak.) Bishop Bartchak’s parents were founding members of St. Monica Parish in Garfield Heights, OH where he was baptized. Bishop Bartchak is the 5thof eight children. His sisters and brothers are Susan M. Gardner (husband David) of Hockessin, DE; Barbara A. Barron (husband David) of Plano, TX; Michael B. Bartchak, of Woodbridge, VA; Philip F. Bartchak (fiancée Sharon) of Pittsburgh, PA; Matthew G. Bartchak (wife Michelle) of Chardon, OH; Elizabeth T. Parsons (husband James) of Willoughby, OH; and Laura J. Tobergte (husband Mark) of Galloway, OH. He has many nieces and nephews and several great nieces and nephews. Immediately after ordination to the priesthood, Bishop Bartchak was assigned as temporary parochial vicar at St. Joseph Parish, Warren, Pennsylvania. In August 1981, he was assigned as parochial vicar at St. Francis Parish, Clearfield, Pennsylvania. He was also assistant principal and theology teacher at St. Francis High Schooland part-time chaplain at the Clearfield Hospital. He was transferred to St. Leo Magnus Parish, Ridgway, Pennsylvania, to serve as administrator of the parish for several months when the pastor became ill. He was then appointed parochial vicar at St. Leo Magnus Parish. His duties included pastoral care at the Elk County General Hospital and the Elk County Prison. In these early parish assignments he was active in local ecumenical clergy associations. He was a speaker at ecumenical and civic gatherings. He gave retreats for Catholic schools in Elk County and preached at various days of recollection and liturgical celebrations in the area. 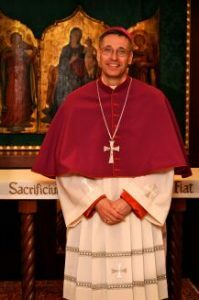 In the Diocese of Erie, Bishop Bartchak was an ex-officio member of the presbyteral council, the administrative cabinet and various diocesan committees. He served on the planning committee for the establishment of the permanent diaconate formation program of the Diocese of Erie. He was a confessor and spiritual director for Project Rachel at Catholic Charities Counseling Services of the Dioceses of Erie, and chaplain to the St. Thomas More Society in Erie. He was also a spiritual director at St. Mark Seminary, Eriesince 1991. For the past several years he has celebrated Mass each month for the men in the Erie County Prison. He has also been a confessor at the Catholic chapel at Millcreek Mall, the largest retail shopping center in northwestern Pennsylvania. He is a member of the Board of Corporators of St. Vincent Health System in Erie. Bishop Bartchak is a member of the Canon Law Society of America (CLSA) and the Mexican Association of Canonists. He has served on several CLSA committees. In 1999 he was elected to serve on the CLSA Board of Governors and later he was elected to serve as Vice-President (2002-2003) and President (2003-2004) of the Canon Law Society of America. During his term as President, Bishop Bartchak represented the CLSA at private meetings at the Vatican with officials of various Congregations, Councils, and Tribunals of the Apostolic See. He has always had a great love for parish ministry. When he returned from his canon law studies, Bishop Trautman approved his request for residence in a center-city parish. Bishop Bartchak was in residence at St. Stanislaus Parish in Erie for almost twenty years where he celebrated Mass each day. He also assisted in hearing confessions at the parish and has participated regularly in other liturgical, spiritual and social events, including parish retreats and often as homilist for the annual Corpus Christi celebration. He assisted the pastor of St. Stanislaus Parish in the pastoral care for refugees (including Chaldean Catholics from Iraq) who have been sponsored for resettlement by Catholic Charities of the Diocese of Erie.